Budget allocates Rs 500 crore for scheme that will provide Rs 3,000 as monthly pension for people with monthly income of Rs 15,000. 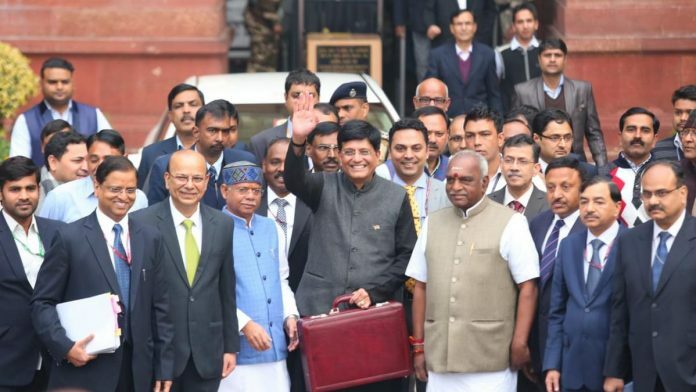 New Delhi: Finance Minister Piyush Goyal Friday announced a Rs 3,000 monthly pension scheme for India’s unorganised sector in the interim budget 2019-20. Named the Pradhan Mantri Shram Yogi Maan Dhan Yojana, the scheme is aimed at people with monthly income of Rs 15,000. It will be a contributory scheme in which pension will be given to people after they attain the retirement age of 60 years. The scheme will benefit 10 crore people, Goyal said. It will cost the exchequer Rs 500 crore, he added. This is the government’s last opportunity to appease the economically weaker sections (EWS) ahead of the national elections due in April-May. The government has already announced job reservation for the EWS. The success of the new scheme remains to be seen. Contributory pension schemes have not been very successful in the past. In 2015, the government had announced the Atal Pension Yojana, which was also a co-contribution pension scheme but it did not achieve the desired coverage.